Many film-makers have begun to shoot on tapeless media. XDCam Ex, P2, video on DSLRs, Red, AVCHD, hard disk camcorders, and such like. So, naturally, where they would store tapes in a cupboard, they now have all their 'rushes' as digital video files sitting on hard disks. Hard disks have become larger, faster and cheaper - like they've been doing for decades now. They've also become more unreliable. Almost anyone who's shooting digital has a hard disk failure story to tell. So what's the best way to backup this new media? A couple of approaches based on my experience. First, estimate who much data you need to store. Red, video DSLRs, XDCam Ex, P2 all have a data rate - a certain number of Gb/hr. For instance HDV is 13 Gb pr hour, Canon 5D or 7D do 19 Gb/hr, XDCam Ex is 16 Gb/hr, Red is 98 Gb/hr and so on. So you can get a number on how many hours of your media a 500 Gb or 1 Tb hard disk can hold. Get hard disks accordingly. In the case of Red, XDCam Ex, and video DSLRs you need to store the original media as well as the media you edited with. So that adds to the number of Gb or Tb needed. One relatively low cost method is to get small 2.5 in. portable hard disks. These cost about Rs 6000 for 500 Gb. You get two drives of even different makes to spread the risk by making a copy on both drives. These drives can now hold you original camera media. This is not what you edit with so the drives need not be fast and so 2.5 in. drives will work just fine. Then for the editing, get 1, 1.5 or even 2 Tb Firewire drives. If you want better speed, get a eSATA drive and fit your MacPro with a SATA card. Or if you have a MacBook Pro, you can get an Express Card adapter to use eSATA drives. For this editing media too, store your files on two drives to reduce the risk of drive failure. Here too, I favour drives of different makes. My favorites are Western Digital and Seagate. But not LaCie. But if you're dong this on an ongoing basis and expect a lot of data, you'll find that you end up with a stack of drives. Leading to newer storage problems. Consider getting a RAID. 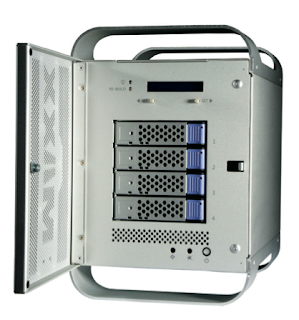 This is an external case that has a bank of 4 or 5 hard disks. These disks work as one large hard disk. They are combined using some magic called RAID striping, that makes them safe. So, in a RAID out of 4, if one disk were to fail, your data is still fully safe. All you need to do is to replace the failed drive and the system automatically rebuilds it and fills it with data that was on the old drive. There are many companies making safe RAIDs for editing. I'm in the process of getting one for myself and testing it for safety for tapeless media for documentaries and features. For long term backup, consider two other mediums - Blu-ray and LTO tapes. These cost less than hard drives and last longer than disks. they don't need power to store data and read it. Blu-Ray is great for backing up video DSLR data. One disk holds 23 Gb which compares nicely with 16 Gb memory cards that video DSLRs use. Or even SxS cards that XDCam Ex uses. Even the Red shoots to 8 or 16 Gb CF memory cards so Blu-ray can be used to back up Red files too. Over time you'll find that you have many many blu-ray disks posing a storage problem of its own. LTOs store more than Blu-ray, typically 400 or 800 Gb per tape depending on whether it is LTO 3 or LTO 4. To backup to LTO 3 or LTO 4, you need to buy a drive that can write to Blu-ray disk, or LTO tape. These drives cost about Rs 40k for a Blu-ray writer, and about Rs 2 lakhs for an LTO drive. If that's out of your budget, consider getting in touch with a post facility that has these drives. They could do the backup for you on a per tape, or per Gb basis that can make it economical. Whatever route you take, factoring the backup of your media is crucial. Digital cameras create data that represents your time and effort shooting. You lose that data just because a drive failed, usually means you've lost all your rushes. Completely avoidable with a bit of planning..